2016 has been a tumultuous time for Don't Flop. All year they have dealt with complaints that their battles haven't been up to the high standards that fans have come to expect from the league. 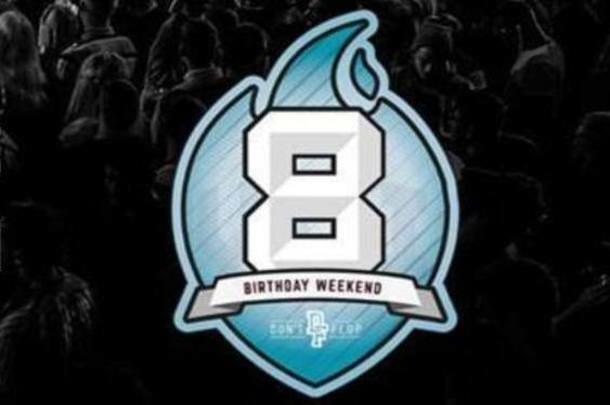 With the "8th Birthday Weekend" event going down November 18-20, the U.K. league is looking to silence those critics and re-establish its place as one of the world's premier battle platforms. Headlining the card will be Pat Stay's U.K. debut against of former DF champion Tony D, a dope U.K. vs. U.K. battle in Soul vs. Quill and some of the best talent from England, Canada, and America. After the release of the trailer, Dialect vs. Lu Cipher and Math Hoffa vs. Shox The Rebel were canceled, joining several other battles that had been axed earlier. Math Hoffa vs. Dialect was booked as a replacement battle, this is reflected in the full lineup below. Probably the most interesting battle on the card is the main event of Day 2, Pat Stay vs. Tony D. This battle pits the likely best, and certainly most popular battler out of Canada, Pat Stay, against someone who holds a similar title in the U.K., Tony D.
This will be Pat's long awaited Don't Flop debut (minus his recent appearance for the league against John John Da Don at the league's AC3 festival showcase), and he certainly didn't get an easy opponent for his first official match. It's not hyperbole to say that if everything goes right, this has the potential to be the best battle in Don't Flop history. In a one-round, non-title battle, Don't Flop champion Soul will be facing off with the returning Quill. Quill had been one of the top rising stars in Don't Flop before some behind-the-scenes issues with Eurgh led to him taking a short hiatus from the league. In his return he's jumping straight back into the deep end. At his best, Soul is one of the best in the world. His writing is unquestionable, and when he's able to bring the aggression to match, he is almost unbeatable. Like Pat/Tony, this battle has a ton of potential to be a standout. "No not really lol and I've said if I don't feel comfy on the day I may not do it cuz man can't expect the performance I had for Lu"
While this is potentially concerning, there have been innumerable examples of short-notice battles that turned out just fine. Something to watch is the amount of battlers pulling double duty at this event. Charron, Chilla Jones, Danja Zone, Pedro, Soul and Big T will all be battling twice. This could prove to be an issue if they're splitting their focus between battles. The Training Days card has some interesting battles, notably Big T battling on it in his first battle of the weekend. Zain Azrai as well makes his return to Don't Flop, taking on battle rap neophyte Shonda Rhymez. Zain is a polarizing figure with some in the community loving his unique style, and it turning off others. Shonda is a fair bit more conventional in her approach, and in her short time in battling has shown herself to have a lot of potential. This could be the type of breakout performance for her that cements her as a permanent fixture on Don't Flop cards.